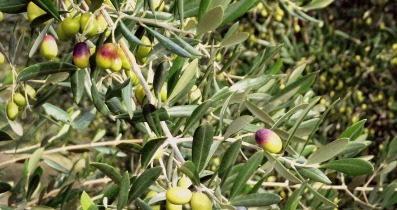 The two major varieties of olive trees planted in the Hillcrest grove are the traditional Tuscan cultivars, Frantoio and Leccino. These trees produce fruit of medium oil content and outstanding character. 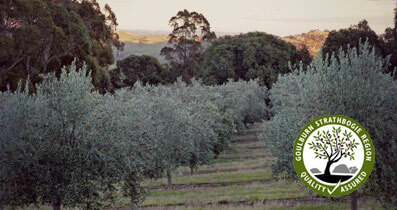 Our trees have been selected because of their oil quality rather than oil quantity. The oil derived from the olive varieties in our grove is carefully blended to produce aromatic and medium intensity extra virgin oil. 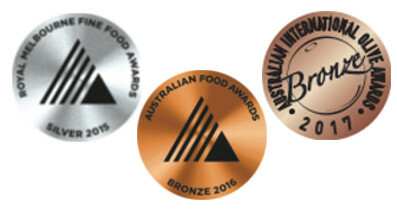 In recent years the Hillcrest blend has received excellent reviews and awards. 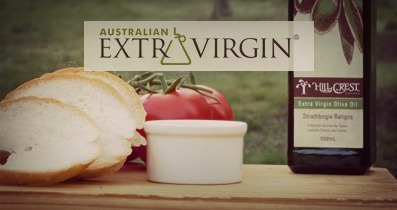 It is regarded as premium extra virgin oil. Mono-unsaturated fats help reduce cholesterol and improve heart health. Hillcrest lies in a region known as a climatic 'sweet spot' for producing exceptional quality olive oil, and a proud member of the Goulburn Strathbogie Olive Growers Association Inc.
Complies with the Australian Standard for Olive Oil (AS 5264-2011) as a high quality extra virgin olive oil that is unrefined, is high in nutritional value and excites the taste buds. Intense fresh aromas of box hedge with floral hints and white pepper like spiciness. The palate displayed moderate levels of riper characters than the nose suggested with more stone-fruit flavours. More herbaceous almost minty flavours followed. Medium levels of bitterness throughout and a strong pepper like pungency on the finish. While moderate in most characteristics, there is a lot going on in this oil.